Being a youth worker continues to be redefined. Here are two examples of temporary part-time jobs being advertised at the Wigan Youth Zone. 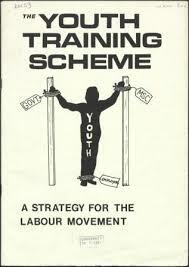 Misnamed youth workers are thus fully integrated into the 21st century’s imposed version of the 1980’s Youth Training Scheme. Cohort information: Cohorts are run on a rolling basis throughout the year. The full time programme is 8 weeks long and part-time programmes of 4 weeks long. Ironically, close on forty years ago, Marilyn Taylor, my partner, was employed full-time as a Specialist Employment Assistant within the Careers Service. Her job was to find work experience placements for young people. She worked closely with the Further Education college, which taught work preparation courses. Meanwhile the Youth Service, for which I worked full-time, related supportively, yet critically to these initiatives. We did not see our role as preparing young people for employment on the employer’s terms, teaching employability skills. We saw ourselves as playing a distinctive part in preparing young people to be active, questioning citizens. In this light we challenged the ideology of then burgeoning Youth Opportunity Schemes and the dramatic rise of the Manpower Services Commission. Given Marilyn was also a part-time youth worker she faced many contradictory situations in this period. At least, though, the tensions were out in the open. Today we suspect the dilemmas are brushed deep under the carpet. Suggest a competition – the most redefined use of the word ‘Youth Worker’ wins? Justin – What might be the prize? Hi. I was in the same position as Maralyn. Full time as employment assistant in Careers and part time youth worker. I gave up my jobs and went to uni to get qualified as a Youth & Community Worker. Finally with no work when staffordshire deleted its Youth Service last December. These ‘new jobs’ all seem to be PT lower paid but still wanting the same skill set! But in the back drop of all the other sh#t that’s going on I think the only people who give a dam are the youth workers.